Sonaura was created with an emphasis on minimalist design and the Japanese concept of 'MA', which is among other things about eliminating clutter. Eighteen stereophonic sounds derived from nature, random noise and minimalist music can provide something for everyone. Press a button to hear a sound. Press it again to stop the sound. Or press a different button. With each sound is a graphic for creating space within for your thoughts or letting go of your thoughts. Sonaura can help you create your own personal soundscape at times (intervals) when your ears are being assaulted by annoying environmental sounds (sonic clutter) that are beyond your control. It's also for times when you want to play Tai Chi or just feel like relaxing or enjoying some peaceful meditation and serenity. Sometimes the little ones are tired and fussy but just can't seem to fall asleep. Sonaura provides soothing, relaxing sounds such as heartbeat and lullabies to help them fall asleep fast and peacefully. Rain 1 – Pouring summer rain. Rain 2 – A gentle, light rain. Rain 3 – Light rain with distant thunder. Ocean 1 – Lying on the beach on a sunny day with breaking waves and distant gulls. Ocean 2 – Ocean waves rolling in during the night. Stream – Gentle stream flowing across rocks. White – Random and equal frequencies within the audio spectrum. It's great for masking undesirable sounds such as traffic, noisy neighbors, etc., and for sleep improvement. Pink – Same noise masking ability as white noise but with more emphasis on the lower frequencies. Some find it more soothing than white noise and it can improve sleep. Red – Also known as "Brown" noise. Greater emphasis on the low frequencies makes this even more mellow than pink noise. Good for relaxation, improved focus, meditation and sleep enhancement. Rain 2 – A gentle, refreshing light rain. Ocean 2 – Long, slow ocean waves rolling in at night. Stream – A gentle forest stream bubbling over rocks. Fan 1 – Small high speed fan for lots of fan sound. Fan 2 – Large box fan at medium speed for a soothing fan sound. Strings – Koto and bass composition for meditation, Tai Chi, stretching, etc. Heartbeat – Rhythmic heartbeat sound for comforting babies. 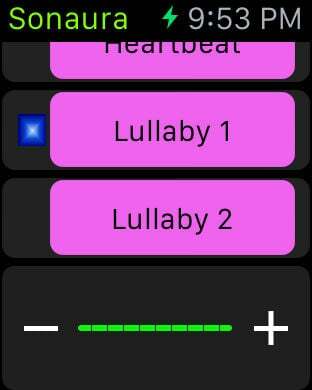 Lullaby 1 – Relaxing lullaby for children of all ages. Lullaby 2 – Unique composition of a classic lullaby that calms and soothes people of all ages. When the phone is paired with a Bluetooth stereo or connected to another device you may want to be somewhere else in the room that is not convenient for operating the phone. 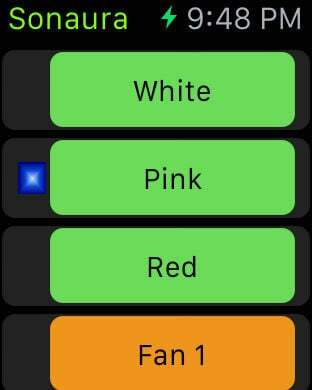 The watch app allows you to select, start and stop sounds and mute or adjust the volume level remotely. The sounds can be configured to automatically stop playing after one hour or up to twelve hours. There is also a free ad-supported version that does not have some features like the Apple Watch app, the convenient volume slider and more.